Punxsutawney Phil may have predicted spring to be just around the corner, but where I live it’s still undoubtedly winter. And while I enjoy the cozy smells and warmth of soups, stews and fresh-made breads that I tend to make more of when the snow falls, there comes a point when you and everyone in your family says: enough is enough! We want something light, healthy and served at room temperature! 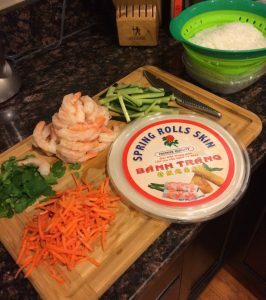 The trick to good spring rolls is all in the preparation. Once the noodles and wrappers have soaked, you have mere moments to assemble before everything turns to mush. Finished rolls also don’t keep particularly well, so try to make only what you’ll eat that day or at most, by the next day. 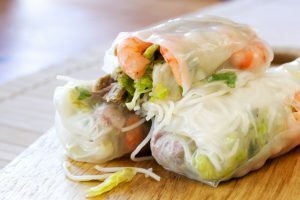 Note: I’ve also stuffed the rolls with chopped romaine lettuce and other veggies, but I’ve found that the crunch of the matchstick-cut carrots and cucumbers go well with the chewy noodles and wrapper. Play with whatever you have on-hand and what will work for you. Cooked chicken, tofu or avocado strips also work well in place of shrimp. Here’s the setup, mise en place (meaning everything in its place so you can assemble quickly). First step is to lightly soak the rice paper wrapper in hot (not boiling) water. 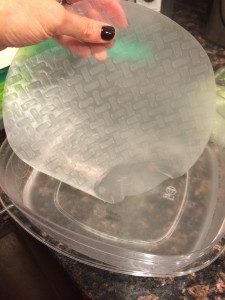 Do not submerge it in the hot water, but rather dip the sides and rotate, leaving the middle section dry (the water will eventually soak into all the dry spaces). 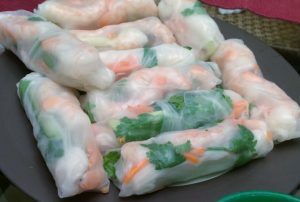 Next, place 3 shrimp in the middle of the wrapper, followed by the carrots, cucumbers, cilantro and noodles. Try not to overdo it on the noodles. The filling should be no more than 50% noodles, 50% everything else. Wrap it like a burrito, folding over the fillings, then folding in the sides, then rolling it all up into one log. Lightly squeeze it to remove any air bubbles. Place on a plate or tray, and repeat as needed. The rolls will stick to each other, so try not to stack them too high or close. Because the rolls themselves are somewhat bland, a good dipping sauce is necessary. We like two types: a spicy sweet and sour, or a peanut sauce. The sweet and sour we use comes from Trader Joe’s, and the peanut sauce I make myself. The recipe was adapted from something I found in an old Cooking Light cookbook (do step 1 of the recipe).